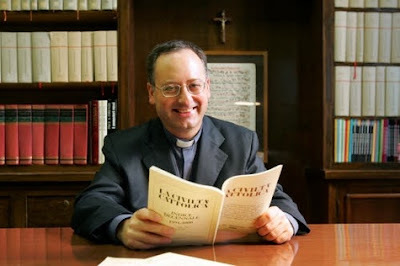 "Doctrine changes when pastoral contexts shift and new insights emerge"
This blog has not ceased to denounce Antonio Spadaro S.J. as a villainous deceiver and a heresiarch. The cunning Jesuit, on a number of occasions, has skillfully and subtly pushed for the Adulterist Party - that is, those churchmen who are advocating the giving of Holy Communion to adulterers. 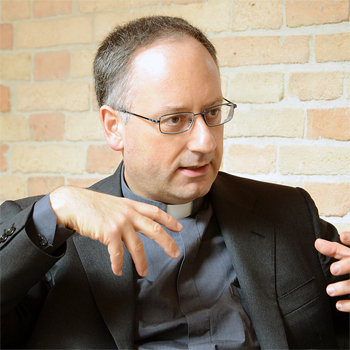 Toronto Catholic Witness has posted a number of times on Spadaro's and others attempts to introduce the acceptance of adultery (the acceptance of sin!) into the Church, all the while denying it, and that doctrine would be changed. The Vox, at Vox Cantoris has written numerous times about this attempt to change doctrine under the guise of only changing pastoral practice. The final report’s paragraph on this topic is deceptive in a very serious way. It gives the false impression of presenting the teaching of Familiaris Consortio, a teaching which is also illustrated in a document by the Pontifical Council for Legislative Texts [to which the final report also refers]. The Synod’s final report suggests that Familiaris Consortio and the Pontifical Council’s document open a way for access to the sacraments by people in irregular matrimonial unions. It is just the opposite. I was truly disheartened that the final report stopped short of presenting the full teaching of Familiaris Consortio in the matter. At the same time, I was also disturbed because I knew this would be used by individuals like Fr. Spadaro and others to say that the Church has changed her teaching in this regard, which, in fact, is simply not true. I really believe that the whole teaching in Familiaris Consortio should have been addressed through the final document of the Synod. During my experience of the 2014 Extraordinary Synod of Bishops, it was as if Pope John Paul II never existed. If one studies the Synod’s final document, the richness of the magisterial teaching of Familiaris Consortio, which is such a beautiful document, is not there.This would have been the ideal time to recover it and present it again in all its richness. One gets the strong impression that, even though it was repeatedly claimed that the Synod was not about relaxing the Church’s teaching or discipline regarding the indissolubility of marriage, this was indeed, in the end, what was driving everything. For Fr. Spadaro, considering all the things contained in the final document, to point to the notion that this Synod accomplished what the other session could not, is very troubling. We have to be honest with one another about this. Something here is not right. Did you read that, dear friends? "...it was as if Pope John Paul II never existed...the richness of the magisterial teaching...is not here...something here is not right". Yet, for people such as Thomas Rosica CSB, the 2014 and 2015 experiences were successes. Dear friends, we need to prepare for every eventuality. Pray, pray for the Pope that he not succumb to the deceitful words whispered in his ear by these heresiarchs who infest Rome and various chanceries and dioceses around the world. Let the Holy Father fall to his knees - for once - before Our Lady of Fatima, who distinctly said: "only I can help you". It appears that Lutheran theology which was really Fr. John Wickliffe s theology in the 1300s, which fomented the English protestant revolution, the American Revolution and the French and Russian revolution, has finally taken over high places within the hierarchy. Including some of the Pope's thoughts. (Oct. 19, 1962) "We should, I believe, face the facts: since the death of Pius X the Church has been directed by weak and liberal Popes, who have flooded the hierarchy with unworthy and stupid men. This present conciliar setup makes this all the more apparent. Father Hanahoe, the only intelligent and faithful member of Cardinal Bea's secretariat has been left off the list of the periti. Such idiots as Msgr. John Quinn and the sneak Fr. McManus have been put on. Fr. Tavard is there as an American. God help us. From surface appearance it would seem that the Lord Christ is abandoning His Church. The thoughts of many are being revealed. As one priest used to say, to excuse his own liberalism, which, in the bottom of his heart he knew was wrong, 'for the last few decades the tendency in Rome has been to favor the liberals.' That is the policy now. We can only do what we can to avert an ever more complete disloyalty to Christ." I think this quote says it all. We must do what we can to save souls and bring to light the "disloyalty to Christ" by those in the Church hierarchy and public office. Why is it that no one ever comments or addresses any Father, Doctor, or Ecclesiastical writer prior to VII? Why? Did not the Church exists prior to VII? By most writings today and comments, people act like the Church began at VII. It is overtime to start addressing and incorporating the writings of the old Father/Doctors/the true saintly popes of the older Church. That is how people find out what the real Truth and the true Magisterium is. I think the author here is kidding himself in suggesting Francis is surrounded by and risking being influenced by dastardly prelates trying to change Church doctrine. Francis is fully on board and directing the efforts. Just take a look at his words and actions. The "good pope surrounded by bad cardinals/bishops" line is a delusion. Reality is reality.